While we need another recording of the infamous Symphony #9 like we need a hole in our head, its important to establish this particular recording is a cut above the rest. The dynamics are second to none, providing a front row seat to one of the most important pieces composed by Beethoven. This record has a sense of realism and air that oozes from the front of the speakers and breaths life into any room. If you speakers are up to task, prepare yourself for jaw dropping dynamics and slam that would make bass booming low riders jealous. Yeah, its that good and Speakers Corner obviously knows what how to bring the goods. It was clear from the start that Beethoven’s Ninth Symphony, with its air of solemnity in the final chorus, which calls for brotherly love just as the New Year comes in, would become a musical part of our world’s cultural legacy. Hundreds of minds, Beethoven researcher Karl Nef prophesied, have been set in motion by this music in the most varied ways, and it will continue not only to bestow pleasure upon countless thousands, but also to stimulate mental life right at the most fundamental level. There are certainly only a very few truly cerebral interpretations which stand out from the fathomless mass of recordings. One of those upon which “The Absolute Sound” journal has stamped its coveted seal of approval is the recording with Georg Solti and his perfectly honed symphony musicians from Chicago. Here, this usually somewhat daring baton-wielder plumbs the very depths of the score and allows Beethoven’s rich abundance of ideas to ferment into a great whole. The four soloists prove their worth as first choice for the richly detailed and balanced synopsis of this fissured work. They captivate us as much in the solo as in the group singing with their natural and expressive intonation. The dry, very present sound highlights the fact that this is an artistic performance at the highest level. There are certainly only a very few truly cerebral interpretations which stand out from the fathomless mass of recordings. 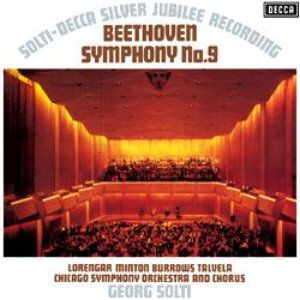 One of those upon which The Absolute Sound has stamped its coveted seal of approval is the recording with Georg Solti and his perfectly-honed symphony musicians from Chicago. Here, this usually somewhat daring baton-wielder plumbs the very depths of the score and allows Beethoven’s rich abundance of ideas to ferment into a great whole. Are your records completely analogue? Are your records cut from the original masters? In our re-releases it is our aim to faithfully reproduce the original intentions of the musicians and recording engineers which, however, could not be realised at the time due to technical limitations. Faithfulness to the original is our top priority, not the interpretation of the original: there is no such thing as a “Speakers Corner Sound”. Naturally, the best results are obtained when the original master is used. Therefore we always try to locate these and use them for cutting. Should this not be possible, – because the original tape is defective or has disappeared, for example – we do accept a first-generation copy. But this remains an absolute exception for us. In order to obtain the most faithful reproduction of the original, we have the lacquers cut on the spot, by engineers who, on the whole, have been dealing with such tapes for many years. Some are even cut by the very same engineer who cut the original lacquers of the first release. Over the years the following engineers have been and still are working for us: Tony Hawkins, Willem Makkee, Kevin Gray, Maarten de Boer, Scott Hull, and Ray Staff, to name but a few. At the beginning of the ‘90s, in the early days of audiophile vinyl re-releases, the reissue policy was fairly straightforward. Companies such as DCC Compact Classics, Mobile Fidelity, Classic Records and others, including of course Speakers Corner, all maintained a mutual, unwritten code of ethics: we would manufacture records sourced only from analogue tapes. Vinyl’s newfound popularity has led many other companies to jump on the bandwagon in the hope of securing a corner of the market. Very often they are not so ethical and use every imaginable source from which to master: CDs, LPs, digital files and even MP3s. Even some who do use an analogue tape source employ a digital delay line, a misguided ’80s and ‘90s digital technology that replaces the analogue preview head originally used to “tell” the cutter head in advance what was about to happen musically, so it could adjust the groove “pitch” (the distance between the grooves) to make room for wide dynamic swings and large low frequency excursions. Over time analogue preview heads became more rare and thus expensive. So while the low bit rate (less resolution than a 16 bit CD) digital delay line is less expensive and easier to use than an analogue “preview head”, its use, ironically, results in lacquers cut from the low bit rate digital signal instead of from the analogue source! Speakers Corner wishes to make clear that it produces lacquers using only original master tapes and an entirely analogue cutting system. New metal stampers used to press records are produced from that lacquer. The only exceptions are when existing metal parts are superior to new ones that might be cut, which includes our release of “Elvis is Back”, which was cut by Stan Ricker or several titles from our Philips Classics series, where were cut in the 1990s using original master tapes by Willem Makkee at the Emil Berliner Studios. In those cases we used only the original “mother” to produce new stampers. In addition, we admit to having one digital recording in our catalogue: Alan Parsons’ “Eye in the Sky”, which was recorded digitally but mixed to analogue tape that we used to cut lacquers. In closing, we want to insure our loyal customers that, with but a few exceptions as noted, our releases are “AAA”— analogue tape, an all analogue cutting system, and newly cut lacquers.